Science Cheerleader Hilary here, taking you across the country to Denver, where we meet rookie Broncos Cheerleader Morgan! 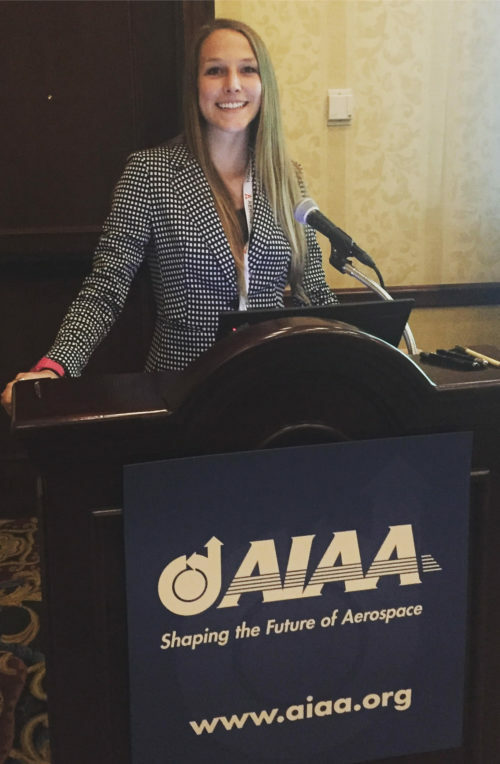 Morgan completed a Bachelor’s degree in Aerospace Engineering with a minor in Computer Science, and then continued on to earn a Master’s degree in Aerospace Engineering! Talk about shooting for the stars! What first sparked your interested in engineering? As a child, my parents did an amazing job at making sure all the kids were around the table for dinner time. My favorite dinnertime conversations were about space. My dad would inspire mind-blowing conversations by asking questions like “What was here before the universe?” and “What would happen if you were to go into a black hole?” By the time we were done with dinner my stomach may have been full, but my mind was always hungry for more answers—answers about space. When the time came to apply for college, the list of degrees on the application was daunting, and to be honest I really didn’t know much about what I wanted to study except that I liked my math and science classes, I liked creating new things, and I liked thinking of new and better ways to accomplish desired outcomes. I was able to narrow my choices down to some sort of engineering, then I started to remember being a kid at the dinner table. The choice became immediately clear: Aerospace Engineering. In retrospect I’m still shocked it took me so long to figure it out! Why did you try out to be a cheerleader? My childhood best friend went to college before me and joined her dance team. I am thankful for her example to me as a freshman in college and have made a point to be an example for women coming after me. By the time I graduated from college, I mentored dozens of ladies. Between helping my female peers realize they could pass their difficult controls class, or that they could manage their extracurricular activities and course work, my professors began to realize they could refer underclassmen to me when they sensed they were beginning to doubt their abilities. What I realized was that we are the ones placing limits on ourselves, more than anyone else! After college, I wanted to make a bigger difference than just among my peers and co-workers, I wanted to make a BIG statement. A platform as an NFL cheerleader seemed like the perfect way to get across my message of pushing the boundaries of what we think we’re capable of. As an engineer and a woman in a male-dominated field, I am pushing the boundaries of the aerospace industry, and as an NFL cheerleader who is also an engineer, I am pushing the boundaries of the cheerleader stereotype. I auditioned for the Denver Broncos Cheerleaders because as an NFL cheerleader I can do what I already love doing and have a visible platform to lead by example. What is a day on the job like for you? I work at Lockheed Martin Space Systems company on the Orion Program. Orion is NASA’s next spacecraft that is going to take people on the next journey of space exploration beyond the International Space Station, and Lockheed Martin was chosen to help NASA build it. I am on the team the makes the autopilot for the spacecraft, similar to how airplanes have autopilot. My team is called Guidance, Navigation, and Control (GN&C) and it is our job to make sure the spacecraft flies to wherever we want it to go, whether it be the Moon or Mars! Now the spacecraft flies based on what the software tells it to do, so I write a lot of software that is going to go on the spacecraft. I also write software that simulates what it would be like if the spacecraft was actually flying in space. Sometimes I go to the lab where there is a mock-up of the Orion spacecraft and check up on how the hardware is interacting with the software. The goal of my work is to safely get humans farther into space than we have ever gone before! What does it mean for you to be practicing in STEM? By using my engineering skills in the real world, I am helping to further our understanding of how humans can explore the solar system around us. It is one thing to be able to send a human to the space station, or a robot to Mars, but it is a new and difficult challenge to figure out how to send humans deeper and deeper into our solar system. Some people don’t realize that humans haven’t been farther than the space station since the Apollo era! I think it’s important for our ambitions and well-being that we keep exploring. Though my job on the GN&C team may be small in relation to the size of the entire program, I know I am contributing to the success of the Orion mission. How do the qualities that make you a great cheerleader benefit you in your STEM career? Aside from the physically demanding nature of game day, cheerleaders can be thrown into a variety of unexpected situations whether it be a fan appearance, TV commercial, sports interview, or teaching a dance class. In my short tenure as an NFL cheerleader, I have found that confidence goes a long way in facing the diverse set of challenges we encounter. This realization of the importance of confidence benefited my work as an engineer because as a new professional I was afraid to make decisions, or even ask questions, though I knew my studies in college had prepared me for my career. After realizing I was simply lacking confidence in myself, I was able to accomplish tasks I previously thought I couldn’t. How do you feel about breaking down negative stereotypes about cheerleaders? When I work promotions with fan outreach, it usually comes up in conversation that the Denver Broncos Cheerleaders all have full-time jobs outside of their duties as an NFL cheerleader. We are all very accomplished women on and off the field. I love when people are surprised that I am an Aerospace Engineer because it means I have just defied another person’s assumption about cheerleaders. Even if I have to break down negative stereotypes one conversation at a time, I’m happy to do it because it means the women who follow in my legacy will have one less challenge to overcome. Best cheerleading experience? My time as a rookie Denver Broncos Cheerleader has been one of the best experiences of my life. My favorite moments are the ones when I can connect with people about something we both genuinely care about, which for me is often STEM. At a Broncos Tackle STEM event, our partners at the Little Shop of Physics brought out over 100 science experiments for our Junior Denver Broncos Cheerleaders to try and I had the opportunity to share a few words with the girls. My message was simple: everyone is scientist because science is all around us, which means girls can do science too! The gratification I received came not only from the girls’ strengthened passion for science, but from the number of parents who approached me after and thanked me for being an excellent example for the girls. The result of this event was the epitome of why I set out to be an NFL cheerleader. Best science-related experience? After defending my graduate thesis, my advisor helped me to submit my paper to a conference for the American Institute of Aeronautics and Astronautics (AIAA). This conference allowed me to publish my first paper, but most importantly, share my work with people who were all working towards a common goal. After presenting to an audience of my peers and engaging in discussion with them, I felt like the work I had been doing for my thesis was valuable and important to the community. This feeling of being a contributing member of the aerospace community was one of the most rewarding of my short aerospace career. What advice would you give your 12-year-old self? I think I would just thank my 12-year-old self for trying hard at school, sticking with my commitments and always having goals. Even though the grades I got in elementary school did not show up anywhere on my college application, I wouldn’t have succeeded in high school or college without the good habits and work ethic I formed during my early school years.